Ivan Franko Homes is committed to transforming elder care in the GTA so our older adults can live meaningful lives in a place they call home. The $70 million Phase I deployment of our Selo strategy includes 160 long-term care, independent living garden and assisted living suites. This will enable spouses with different support requirements to not be separated by geography but to continue aging together on the same campus. Phase II will extend the 'aging in place' market to include those recently retired 'baby boomers' seeking access to a Ukrainian cultural and social community while independently living in luxurious accommodations which may include condominiums and/or town homes on a purchase, life lease or other basis. 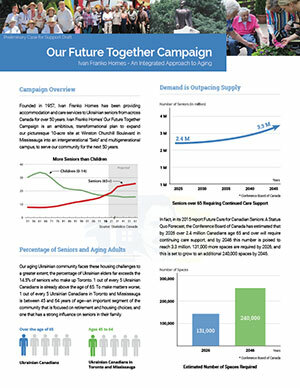 The $70 million Our Future Together Campaign will raise the urgently needed funds to continue and expand upon the excellent care Ivan Franko Homes is proudly providing our community. Together we will give our community a place we can call home for generations to come.  Copyright © 2017 Ivan Franko Homes All Rights Reserved. Designed by FUNDING matters Inc.